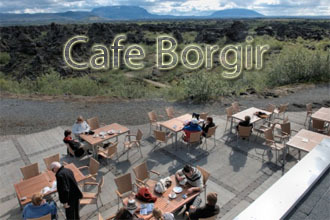 Cafe Borgir is in one of the most scenic spots in the Myvatn area, with a great view over both Dimmuborgir and the lake itself. Cafe Borgir offers a selection of local specialties, light meals and A La Carte dinner menu. Cafe Borgir is a fully licensed restaurant that seats approximately 50 inside and up to 70 outside. Myvatn market souvenir shop is located in the same building. Myvatn market has a wide variety of souvenirs, books, woolens and other clothing at competitive prices. Foreign visitors also enjoy the benefit of tax free shopping. The unique lava formations of Dimmuborgir are among the most popular tourist attractions in the Myvatn area. For decades there have been no facilities for visitors at Dimmuborgir but this finally changed in June 2009. The newly constructed service centre at Dimmuborgir is strategically placed to enable visitors to appreciate the spectacular panoramic views. It was none the less designed to blend in with the environment and be as unobtrusive as possible. It also houses public restroom facilities, a welcome relief for visitors.